A storm is coming. From his prison cell, Shadow can feel it bearing down on him, but he has no idea how it shred his already tattered life and cast the pieces into realms both familiar and mythical. Shadow’s journey across the real and imagined terrain of America is the gravitational mass around which the rest of the novel accretes. We follow him out of prison, to a portentous meeting with his eventual employer Mr. Wednesday, back to his home town, and beyond to a magical carousel in a bizarre roadside attraction, to a small Wisconsin town peopled by a hundred unique, quirky characters, down to little Egypt, across a barren Indian reservation, and even to the geometric center of the contiguous states. His discoveries of the languishing deities brought to this continent and abandoned by assimilating immigrants are our own, and the questions he faces about the nature of human faith and the fulfillment of ourselves in mystical sacrifices are questions we find ourselves struggling to answer. But Shadow’s story is not the only one. The mercurial Mr. Wednesday also has a tale to tell, as do a half-dozen or so other deities, spirits, leprechauns, and phantasms. Their stories are tough, tender, tragic, uplifting, and ultimately doomed. But even they are not the full measure of this book. There are also newly-minted gods of television, computers, covert operations, and other creations of modern angst. They represent a malevolent opposition to the old gods, and the storm Shadow has foreseen is the clash between the old and new gods in a battle for the devotion of an attention-deficit populace. 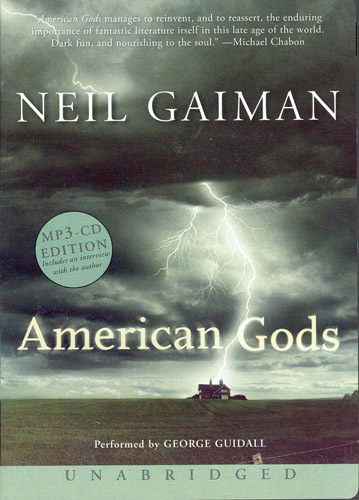 American Gods is one of the great novels of modern fantasy, and lands just short of the fence as a great American novel. Much of its power is derived from its complexity: It is composed of religion, adventure, a small-town thriller, a road novel, history, con-games, Native American myth, early American legend, intimate portraits of immigrants finding their small way in a huge new country, and sprawling adventure across the entire face of America. Written by an imported Englishman, it offers both an outsider’s attention to quirky detail and a native’s casual acceptance of all that comprises this slow-simmered stew of a country. Gaiman’s prose is graceful, simple, and his pacing is slow enough to nurture our sympathy, yet brisk enough to remain consistently exciting. George Guidall’s narration is also excellent. His portrayals are groaning, snippy, kvetching and distinct. He conjures a pantheon of note-perfect Eastern European accents for a group of little-known gods, a crisp con-man’s coarseness for Mr. Wednesday, a mischievous African charm for Anansi, and a quiet desperation for Shadow. The only misstep is Shadow’s wife Laura, whose voice seems too fawningly girlish for the part. The MP3 CD format is the best so far invented, and the sound quality is crisp. Maybe too crisp, as you can clearly hear the edges of many of the edits. After the multi-threaded end of the story, there is an extended interview with Gaiman which provides a delightful look at the man and the origins of his story. While I found it fascinating to see how such a large collection of ideas coalesced into a single transcendent work, the interview also rubs off just a little of the luster. Overall, though, the entire production is a pleasure from the first ominous chapter to the last. It will make an enviable centerpiece to your audio fiction collection. Escape Pod Podcast has a Robert J. Sawyer story!